Happy Wednesday, Friends! I'm currently at the beach, and while here, I always like to touch on a few of my favorite items that I feel are "must-haves." 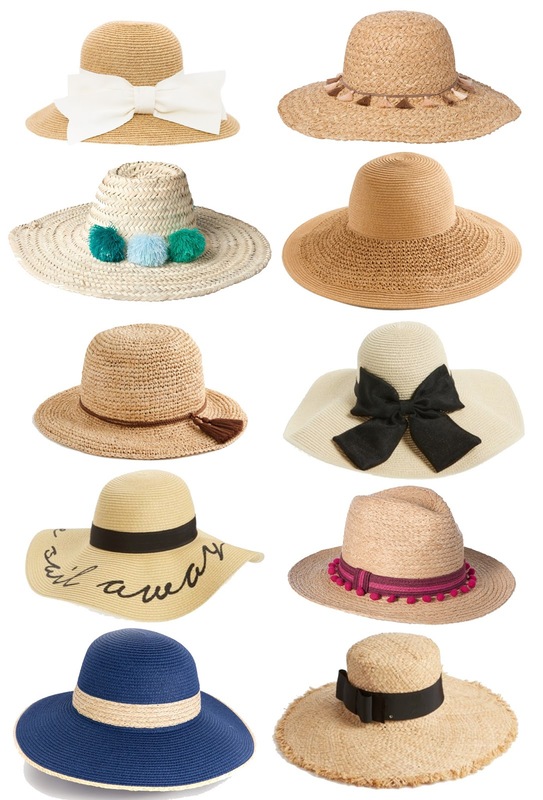 Especially since it's summer time, it's always a good idea to have a sun hat (or a few) on hand. I've learned the importance of protecting your skin, especially since I have my baby's skin to protect. I've always worn sun hats for a few reasons...to help protect me from the sun and to help keep the sun directly off my hair, for example. This summer and last, I developed another important reason to wear a sun hat (especially a wide brim one). When I'm holding Madeline in the pool or pushing her around in a float, my sun hat has served a dual purpose in not only protecting me but also with blocking the sun off of her. So, I don't know what I'd do without my sun hats. I have a few of the ones I'm featuring here today. I think it's safe to say that there are some adorable sun hats currently out. All of the ones I have listed above are under $100 with most of them being under $60. This perforated sun hat is on sale for $17 through today with the code "WEDNESDAY". I think my favorite sun hat of all in terms of fit, structure, quality and versatility would have to be this packable bow hat. It's $60 and worth every single penny. There's a reason it's called packable...it packs so well and takes its shape back with ease. It feels like such a great fit when wearing it. It's not too heavy, and not to mention, it's absolutely adorable. It also comes in navy and black. I am absolutely obsessed with this pom-pom sun hat 😍 Also, this "Come Sail Away" sun hat is a $26 look-alike for a $400+ style hat. So cute! Also, I have learned that this style sun hat is the very best style for babies. There are so many cute ones out there, but let's face it, only the ones with a strap under the chin are going to stay on our babe's heads with the wind and them puling at it. Madeline hates wearing a hat. She always fusses when I put one on her, and the only way I can get her to keep it on is if I try to get her mind off of it. I'm so scared her little head is going to burn, so I've been spraying some baby sunscreen on it in desperation. Have any of you mamas out there had similar experiences? I love the wide brimmed hat with the black bow! I am just getting in to wearing hats and loving it! Hope you guys have a great time at the beach.